A weekend sweep at home over both Hampden Academy and John Bapst has pushed the Presque Isle Wildcats’ hockey team into third place in the latest Heal Point standings in Class B North. 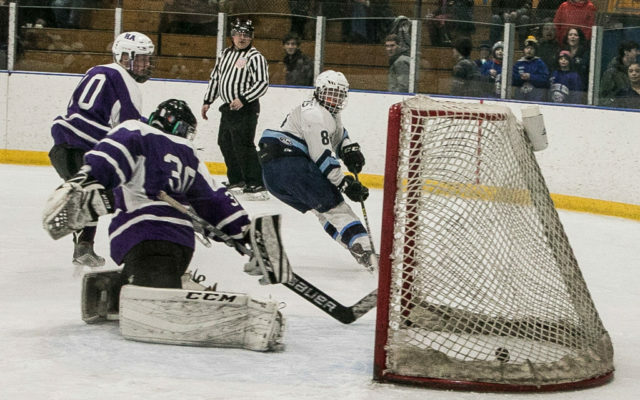 PRESQUE ISLE, Maine — A weekend sweep at home over both Hampden Academy and John Bapst has pushed the Presque Isle Wildcats’ hockey team into third place in the latest Heal Point standings in Class B North. Coach Carl Flynn’s team is now 12-3 overall with three matches remaining — at Houlton Thursday, at Old Town-Orono Saturday and home against Brewer Monday. The Wildcats trail only Old Town-Orono (13-2) and the Kennebec Riverhawks (12-3) in the rankings. On Friday, Jake Stevens and Colby Bonville staked PI to a 2-0 lead after the first period over the Broncos and the hosts went on to win, 4-1. Jonah Roy assisted on Stevens’ goal, while Stevens picked up the assist on Bonville’s after winning a faceoff late in the period. Hampden cut the lead in half midway through the second, but Colby Carlisle scored off assists by Gage LeTourneau and Connor DeMerchant. Roy put the game away with a goal off a Riley Kinney assist in the third period. Andre Daigle played in goal for the Wildcats and made 16 saves. Presque Isle held a 28-17 advantage in shots on goal. Senior Thomas Patenaude went down with a shoulder injury on the first shift of the match and did not return. He also missed Saturday’s game and his status is “day to day,” according to coach Carl Flynn. Against John Bapst Saturday, the Wildcats nearly recorded the shutout but settled for the 3-1 victory. LeTourneau netted a first-period goal, while Jaren Winger scored in the second off assists by Kinney and DeMerchant. Stevens added a goal in the final period off assists by LeTourneau and DeMerchant. Presque Isle held a 29-22 advantage in shots on goal, with Daigle going the distance in goal to pick up the victory. “We played solid team defense and created ample scoring opportunities,” Flynn said.